Professor Johnson: How is your Spanish pronunciation? Try the new Google Docs Add-On, and see if it understands your accent. How is your Spanish pronunciation? 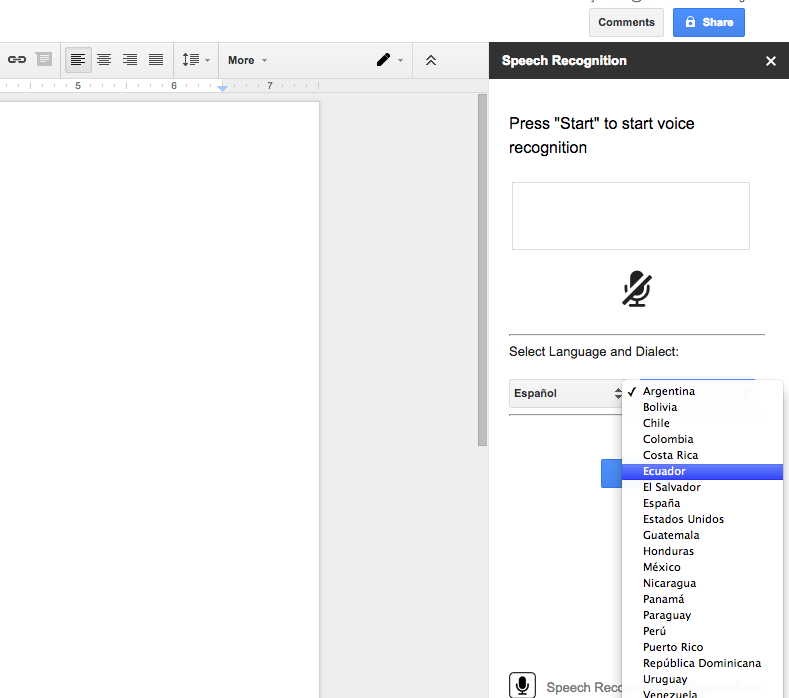 Try the new Google Docs Add-On, and see if it understands your accent. I recently came across the Google Docs Add On Speech Recognition and have so far found it as an incredible tool especially for language learning. The Add On uses the same technology that Google uses on its homepage for speech recognition. This means that it is good and getting better each day. What is most impressive to me about the Add On is the amount of languages and even accents that it has to choose from. Go ahead and try it, I'm sure your curious about your own accent! It has an incredible amount of accents to use, especially for Spanish. This add-on has really helped me develop a whole new layer to my Spanish classes. My students can correctly answer questions and speak spanish. But now they can make sure they don't sound like Keanu Reeves in Point Break. (One of the great movies of all time none the less). The Add-On will not work if you don't put effort into your pronunciation, and this has really done an incredible job giving individual students valuable feedback to how they are speaking. I have already noticed students who at first could not get a single word to work, are now after some practice doing whole sentences and really speaking with a better accent. The add-on also has an added bonus in that it will not spell out adult language! This is actually a lot of fun and I recommend you give this a try with the same crowd of friends you usually play cards against humanity with. All you will see though is the first letter followed by stars like this s*** .So this Add-On will prevent foul mouth students from at least speaking any poor language on their docs. Give it a try and let me know what you think! The Add-On is only for Google Docs and can be found at the bottom of the Add-On list. Shaun Johnson is a teacher and instructional technology specialist. He is a Google Certified Innovator, Google for Education Certified Trainer and holds teaching certifications in both Social Studies and Spanish. He has been teaching Spanish in Scarsdale Public Schools since 2011 where he has innovated and pushed the boundaries for how technology can enhance language learning. He has a passion for languages and loves training and teaching in English, Spanish and Portuguese. What's new in my classroom?